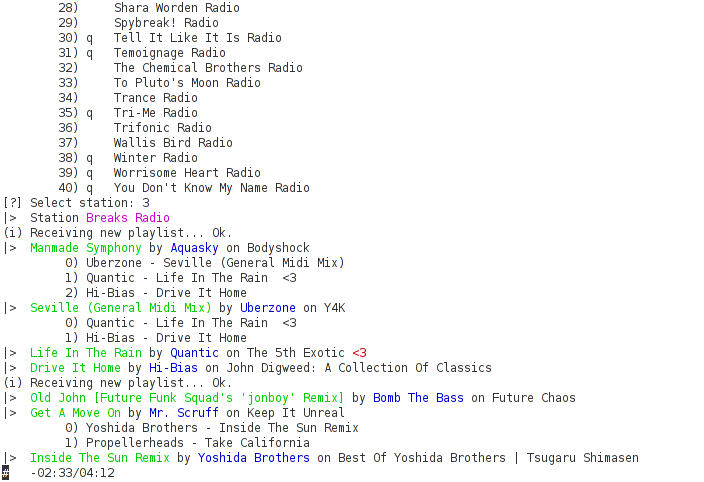 pianobar is a free/open-source, console-based client for the personalized online radio Pandora. There are community provided packages available for most Linux distributions (see your distribution’s package manager), Mac OS X (MacPorts or homebrew) and *BSD as well as a native Windows port. The current pianobar release is 2019.02.14 (sha256, sign). More recent and experimental code is available at github and the local gitweb. Older releases are available in the attic. The audio output does not work as expected. What can I do? pianobar uses libao and most problems are related to a broken libao configuration. Have a look at issue #167 for example. Can I donate money? Do you have a Flattr/Bitcoin/… account? No, money is not necessary to continue working on pianobar. There are many other ways to support pianobar: Reporting bugs, creating cool stuff based on pianobar, blogging about it and the most important one: Keeping Pandora alive.